Get the double of cleanliness and care for your hands with Dettol Liquid Handwash Sensitive and Original Liquid Hand Wash Refill. Your Trusted Dettol offers a new and improved Dettol Liquid Handwash Sensitive. Handwashing is the best way to prevent the spread of illness-causing germs and help your family to stay away from them. Dettol Hand Wash range not only provides your skin with a delicate care and fresh fragrance, they also help prevent the spread of germs. Use it like any other soap in the kitchen, bathroom or anywhere you wash your hands. It gives 10 times better protection against stomach bugs and skin infections. Using it every day protects hands from germs and helps keep them hygienically clean. The pH balanced formula contains pure glycerine, clinically proven to be mild on your skin, while providing Dettol's trusted protection. 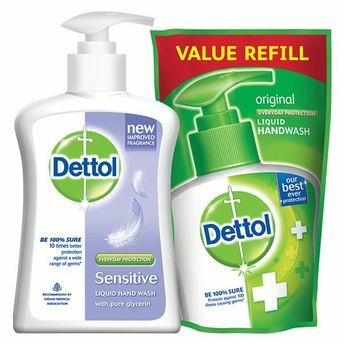 Your Trusted Dettol offers a new and improved Dettol Liquid Hand Wash Refill Original. Handwashing is the best way to prevent the spread of illness-causing germs and help your family to stay away from them. Dettol Hand Wash range not only provides your skin with a delicate care and fresh fragrance, they also help prevent the spread of germs. Use it like any other soap in the kitchen, bathroom or anywhere you wash your hands. It gives 10 times better protection against stomach bugs and skin infections. Using it every day protects hands from germs and helps keep them hygienically clean. The pH balanced formula contains pure glycerine, clinically proven to be mild on your skin, while providing Dettol's trusted protection.